Audi says the Q7's all-aluminum outer skin makes the SUV look like a well-toned athlete. Audi has packed its new Q7 with a rich mix of advanced technologies that improve safety, comfort and connectivity while simultaneously reducing the large SUV’s fuel consumption. Audi says the Q7 is the first premium SUV to offer all-wheel steering, which significantly improves the vehicle’s agility. This makes the Q7 easier to park because at low speeds the rear wheels move in the opposite direction, which reduces the SUV’s turning radius by up to 1 meter. The all-wheel steering also makes the SUV more responsive if the driver needs to make an evasive maneuver at high speeds. Another key Q7 feature is what Audi calls "predictive efficiency assistant," which in combination with the adaptive cruise control automatically adjusts the preselected speed based on the route topography, speed limits and road users ahead. Even if the route guidance is disabled, the system uses the route data to alert the driver about situations when it is advisable to slow down. It does this because it recognizes curves, traffic circles, intersections and speed limit signs -- in many cases long before the driver sees them -- and provides a message with detailed graphics to the driver about the forthcoming situation. 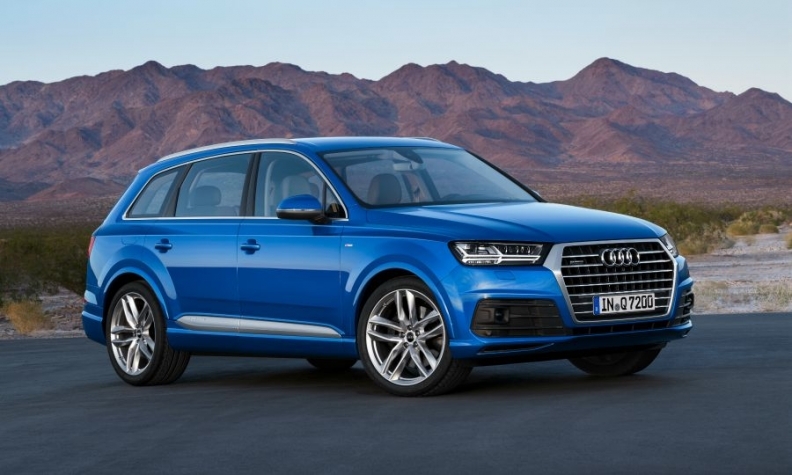 To help reduce fuel consumption, which is up to 28 percent better than the previous model, Audi made the second-generation Q7 325kg lighter, largely through the heavy use of aluminum. The lightweight material makes up 41 percent of the Q7’s body structure, compared with 0 percent in the previous-generation model, this includes the complete outer shell, the doors, which are 24kg lighter than the predecessor model's, as well as the front fenders, hood and tailgate. The new Q7 is 37mm shorter at 5050mm and its width was reduced by 15mm to 1970mm compared with the previous-generation SUV. Despite the leaner dimensions Audi says the Q7 offers the largest interior in the segment, including 41mm more headroom in the front seats compared with the last Q7. The five-seat variant’s luggage space grows to a maximum of 2,075 liters with the seats folded flat from 2,035 liters for the previous model. In Europe, Audi will start taking orders for its Q7 e-tron quattro plug-in hybrid in late 2015 and start deliveries in early 2016. That variant of the SUV combines a diesel engine with a lithium-ion battery, resulting in a vehicle that can go from 0 to 100kph in 6 seconds but consumes 1.7 liters of diesel per 100km. The Q7 e-tron quattro offers a full-electric range of 56km and a combined diesel and electric range of 1,410km. Connectivity: The Q7 offers Apple’s CarPlay and Google’s Android Auto smartphone in-car control system, which can be operated using either voice commands, the multifunction steering wheel or the push-button control in the center console. Both platforms offer navigation functions, missed call information and appointment reminders. In addition, the Q7 has an LTE/UMTS module that provides a high-speed Internet connection and includes an integrated WiFi hotspot that allows passengers to surf and email with their mobile devices. The Q7 also offers remote control locking and unlocking as well as information about the SUV's current park position. Technology: The Q7’s predictive efficiency assistant can be given control of the SUV’s eight-speed transmission to allow maximum coasting, which Audi says can reduce fuel consumption by up to 10 percent on country roads. What's good: The intuitive automatic transmission always put the SUV in the correct gear at the right times during testing on challenging mountainous terrain.